(Grinning) I’m probably not going to talk about what you thought I was going to talk about. Does size matter? Does the size of your manuscript matter? It used to be a crucial point in the planning and selling of a manuscript. And in some arenas, of course, it still is. With my books that were published in hard cover format, there were actually physical limitations with the number of pages that could be stitched together, and bound into each edition. In the paperback and trade markets, it can be a matter of the cost of paper, ink, and the weight of shipping. Truly, these points have little if anything to do with our stories. Or our readers. But some lines, especially in the romance field, are categorized as “short contemporary or short historical”, or long. Some categories are expected to be “longer” or “bigger books”. These delineations have to do with reader appeal, some people have always preferred “long or short” for their reads. Ebooks have opened another option, and I see that option gaining strength. Novellas (or shorter books, usually described as being between 20,000 and 40,000 words) are becoming more and more popular. In ebook format, there aren’t lower end limits to the number of pages it takes to “print a book”. Novellas can be a quick read, a great demand for the super busy reader who has smaller chunks of time to devote to a story. I began writing novellas a few years ago, especially around the holidays. Readers keep requesting more. There is something about the shorter read that is appealing to today’s romance customers. It’s a challenge sometimes to get the character depth and emotion into fewer pages, and usually we must forego much in the way of subplots. But an emotional, meaningful story can be crafted, and I’m finding it a lot of fun. Today, bundling is becoming more and more common. 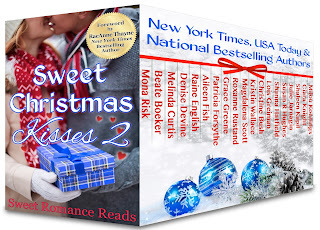 I just had the wonderful opportunity of adding a Christmas novella to “Sweet Christmas Kisses 2”, an anthology containing 19 sweet romance novellas. It’s a long lasting Christmas present that can be purchased with one click. Adding novellas together (either several from one author, or several authors combining their work) makes a nice sized book, yet with divisions that fit that “short” criteria desired by busy readers. Different strokes for different folks. How about you? Readers, are you enjoying novellas? Why or why not? And fellow writers, are you writing them? With my schedule these days, I usually prefer the shorter ones. I might actually finish a story for a change. Great question. I have written my first novella (25k words) and readers are telling me they can't wait to read it. To be honest, now I've written a novella, I love that length and will possibly write more. I am currently devouring all the Christmas novellas coming out from the authors in this group and finding that length novel is great when I'm busy and don't have time to get stuck into a long book.Christine, which one of your books do you recommend first?